While the Volkswagen cars built at the Westmoreland, PA are an interesting sidebar in VW’s production history (together with the South African CitiGolf and the Mexican Caribe), but their compromised interior design and quality, together with softened suspension, mean they’re not viewed all that fondly by enthusiasts. That said, survivors are few and far between at this point, and it’s interesting to look back and see what a former Chevrolet executive thought was the right strategy for selling more Rabbits in North America. 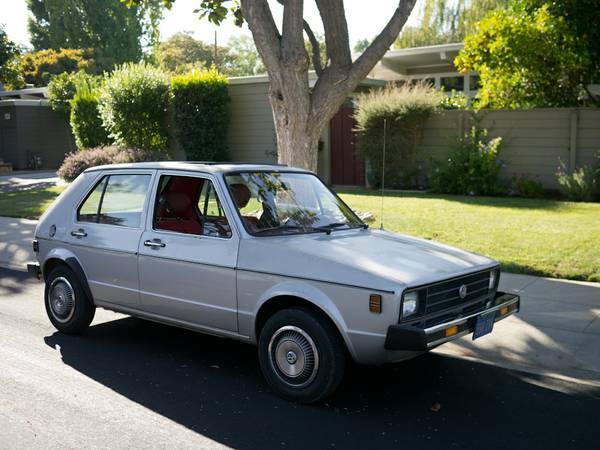 Check out this 1980 VW Rabbit Diesel for sale for $2500 in Palo Alto, CA. This car looks very similar to the gasoline-powered two-door silver 1980 VW Rabbit L on which your faithful correspondent learned to drive, so featuring it was a slam-dunk. Unfortunately, this one appears to have a red interior, and while silver on red is a great color combination, it’s not when the red extends to the dashboard, headliner, steering wheel, and probably more. Rabbits of this era also had an odd passive restraint system comprised of a shoulder belt attached to the door, and a supplemental lap belt if you didn’t want to submarine under the shoulder belt. The rear view did not change much on the Westmoreland cars, aside from badging and bumper, but you have a clear view of how red things were inside, as if you were peering into someone’s body. The original blue plates mean this has likely been a California car since new, but unfortunately it’s impossible to make out the selling dealer’s name on the license plate frame. 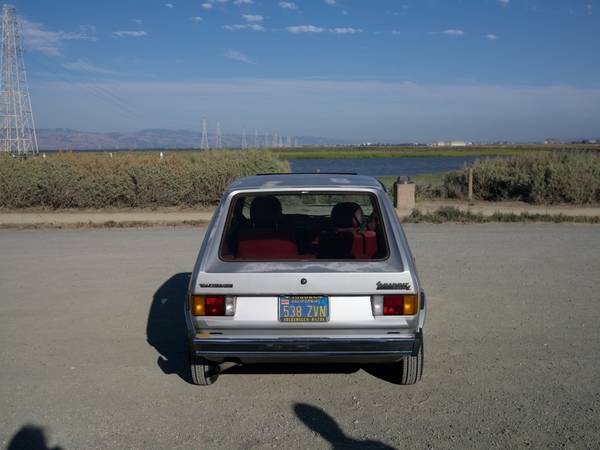 This car is said to have 134,000 miles, and aside from some fading, looks to be in pretty clean, original condition. The most noticeable exterior feature, aside from the bumpers, is the square-headlight grill. One has to wonder why they did this – was it just to be different? Did focus groups show 82% of Americans preferred square headlights over round ones, given the choice? It is definitely more consistent with the design of the car, although the most desirable grill is the big-and-little round headlight version fitted to later GTIs and Cabriolets. The engine is said to have some blow by, but starts and runs well, and is a good candidate for replacement by, well, you name it… how about a 16-valve GTI engine? There’s a full laundry list of all the work that’s been done to the car, including attention to the brakes, suspension, fluids, and filters, so it should be ready to be driven. 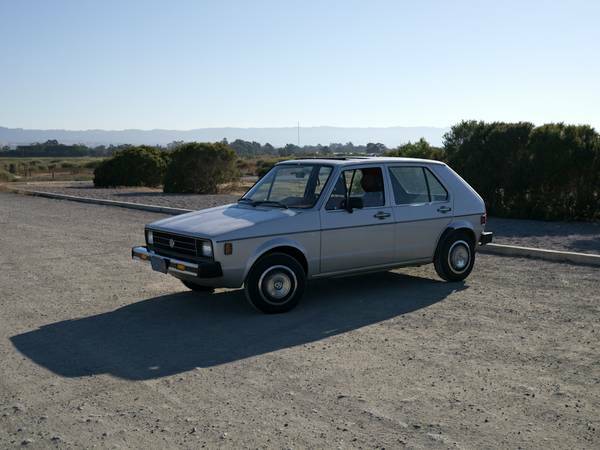 What would you do with this sidebar of VW history? This entry was posted on June 25, 2014 at 11:41 am and is filed under Feature. You can follow any responses to this entry through the RSS 2.0 feed. You can leave a response, or trackback from your own site. I saw one of these years ago at an auction 400,000 miles on it and seemed to be in better shape then this; fuel was a $1.40 a gal. so it was basically worthless because of the miles but I’d like to have one now 50mpg!! Nice! Impressive that it still has all its hubcaps – my parents sold theirs in 1991, and even then one or two had flown off and needed replacement. Kinda cool to see it not slammed-with-obligatory-luggage-rack.